As a statement of best wishes on the occasion of a religious event, the intended receiver is supposed to feel good about who they are and what they do. Instead, Trump’s statement made Muslim Americans feel demeaned and defamed. Trump’s statement connected all of Islam to terrorism and portrayed Muslims as people who are prone to violence. Not once did the president use the phrase Muslim Americans. 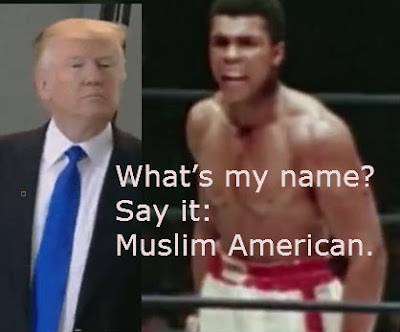 Instead, he talked down to Muslims as foreigners who live in far way places everywhere else in the world, though he acknowledged that some of them--Muslims--live in the United States, but not as Muslim Americans. If that offensive message was not enough, Trump’s choice for the post of the nation’s top diplomat emphasized the same attitude. On May 29, Secretary of State, Rex Tillerson, declined a request to host an event to mark Ramadan, breaking with a bipartisan tradition in place for nearly 20 years. Taken together, it is clear that this administration does not recognize Muslim Americans as full citizens of this country. This statement is not based on speculations, it is based in facts—the kind of facts that withstand legal scrutiny. Four courts and judges found Trump to hold anti-Muslim views and for that reason they ruled against his Executive Orders--widely known as the Muslim Ban--in the original and revised editions.